After his first birthday, your baby’s growth will slow down and their appetite may drop sharply. However, nutrition is still very important, as it plays a role in functions other than growth - like overall development. While you should ideally continue breastfeeding your child, this is also the age to introduce more new foods so as to meet nutritional needs and help your little one learn to eat like the rest of the family. Children of this age group need around 1,000 calories a day. At the age of 1 year, children can be introduced to fish, chicken and eggs, after consulting a paediatrician. However, while doing so, certain things have to be kept in mind. The iron requirements of infants increase after the six-month mark due to the importance of iron for brain development. This is a stage when there is a risk of iron deficiency in children. Introduce foods like spinach, fortified grains, meat and fish which are rich in iron. Foods with Vitamin C - like tomatoes and oranges - should also be introduced as they increase iron absorption. Fish and meat should only be consumed 2 times a week, in small servings. They fulfil protein as well as vitamin needs but should be fed in moderation to avoid digestive issues or excess protein consumption, which can harm the kidneys. Your baby should not be eating high mercury fish like king mackerel, certain types of tuna, and shark. Make sure to introduce your baby to at least one new food a day, while also ensuring your baby eats some food from each of these food groups every day. Remember to increase the intake of fruits and vegetables, and ensure that your child eats a variety of foods. Follow hygiene and cook fish, poultry and eggs well to reduce any risks of infections. Avoid serving these foods to your little one if undercooked, overcooked or raw. Make sure that your baby eats food only while sitting up to reduce the risk of choking. Moreover, food has to be in a semisolid or puree form for the same reason. The age from 12-24 months is a period of not only rapid growth but also increased activity. 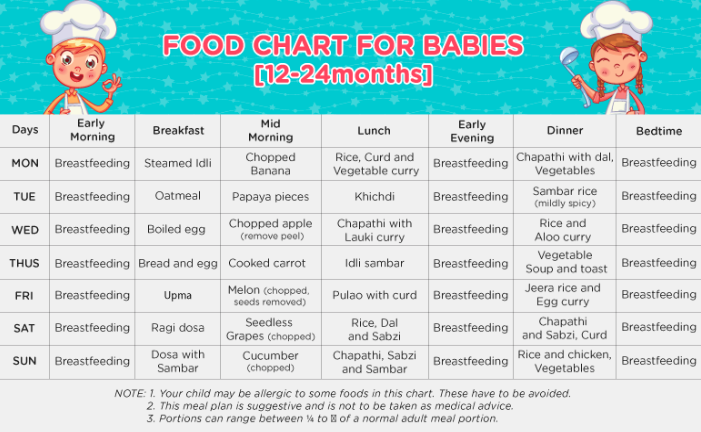 To support your child’s nutritional needs during this period, it is important that the meal plan you introduce consists of nutrient-dense fortified foods.